Texas Memory Systems designs and builds solid state storage systems for accelerating essential enterprise applications. The award-winning RamSan product line, known as “The World’s Fastest Storage®,” delivers fast, reliable, and economical solutions to a broad base of enterprise and government clients worldwide. RamSan disks not only outperform the fastest conventional drives hundreds of times over, but are many times faster than the closest competitor. 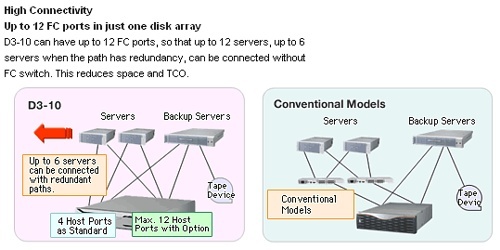 Each RamSan model outperforms all other brands of solid state disks while remaining simple in design, fully integratable with existing storage area networks, affordable and scalable. Founded in 1978, Texas Memory Systems continues to architect and engineer the future of solid state storage. As a large enterprise business, your company generates a massive amount of important business data that needs to be stored and secured, but also must remain accessible 24x7 to your employees. You need storage solutions that can meet your capacity, security and performance requirements-but that are also efficient and cost effective. Selecting the proper storage solutions and creating a smart data management plan will help you enhance your business and succeed in today's competitive marketplace. High-density servers and tiered storage solutions are the foundation of efficient computing, and the enterprise relies on Seagate to deliver advanced storage products for every IT environment. Hitachi Global Storage Technologies was founded in 2003 and was formed as a result of the strategic combination of IBM and Hitachi's storage technology businesses. Storage is one of Hitachi's five core businesses; substantial technology and financial resources have been committed to ensure a successful and profitable business. The company's vision is to enable users to fully engage in the digital lifestyle by providing access to large amounts of storage capacity in formats suitable for the office, on the road and in the home. Hitachi Global Storage Technologies is positioned to immediately advance the role of hard disk drives beyond traditional computing environments to consumer electronics and other emerging applications. Digi-Data produced its first SCSI RAID controller in 1992. It incorporated five key patents involving RAID technology and virtualization, which form the basis of the STORM (STorage On Redundant Modules) architecture. Bringing a unique, clustered architecture to market that scaled in multiple dimensions ( performance, capacity, availability and access ), Digi-Data found their niche in several major accounts, including Disney, DLJ, ABC, FermiLabs, and World Bank. Leveraging the unequalled capacity and availability characteristics of the T-4000 Clustered RAID technology, and the Internet storage management architecture, Digi-Data is emerging as a leader in the Storage-as-a-Service arena. With a comprehensive API to connect financial, data protection, or content management applications, partners can add the dimension of remote protection and anywhere-access to their list of features.